Even though it’s a rudimentary movement pattern, many people have difficulty performing the inverted foot hand crawl (aka the “crab walk” or the “crab crawl”) with efficiency – including very fit individuals who have simply never learned how to perform this basic move properly. Simple mistakes are more common than you might think, and they can lead to problems down the road. While the inverted foot hand crawl is not a high risk movement pattern, like some of the more strength and power-oriented skills, there is still some risk involved when training improperly, particularly if you have a history of shoulder, neck, or back problems. Fortunately, most technique problems are very easy to correct, and the drills below will help you get the technique down. From then on, you’ll be crawling more efficiently, which will lead to better fitness and movement instead of long term pain and injury. First things first, why the inverted foot hand crawl? The inverted foot-hand crawl is a practical movement that allows you to crawl on all fours in a supine position (facing up) while potentially carrying something in your lap. It is a safe way to crawl down steep inclined slopes. It also enables you to make brief pauses in a bent sit position which is handy when having to cover very long distances. The problem is that many people experience wrist discomfort when crawling on all fours. In that sense, the inverted foot-hand crawl is no different than the regular foot-hand crawl (aka “bear” crawl). So, you’ll want healthy, stronger wrist joints before you can do it pain-free. This can be achieved by first practicing the positions rather than the crawling movement itself. This is because the “foot-hand” position puts a lot of stress of the wrist joints, and sometimes more than they are prepared for. An important way to address this is to spend more time…and less time in this position. Confusing? It’s actually very logical. What I mean is that instead of trying to crawl on all fours for too long or over too long of a distance, you want to spend LESS time in such positions yet MORE frequently. In other words, practicing more frequently, but with less intensity. 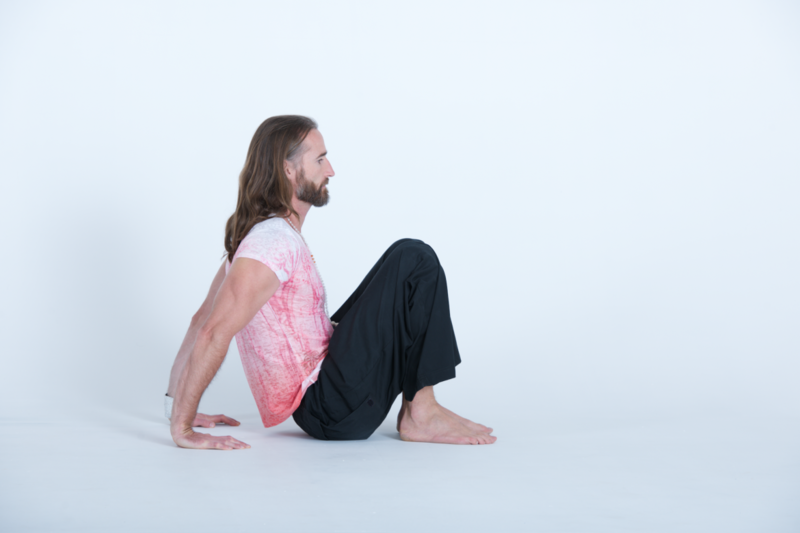 Now, the seated version is a great way to get ready for the actual crawl, first off in term of prepping your joints and tissues to handle sustaining such specific positions, secondly also in terms of making you familiar with the efficient mechanics of the technique. The following perception drills will help you understand where the motion mostly comes from in the inverted foot hand crawl: pushing from the feet when moving backwards, pulling from the heel and through the hamstrings when moving forward. First assume the seated position, resting on your rear. Place your hands behind you, not too close or far, about a foot away from your rear. The orientation of your hands doesn’t matter too much. It could be forward, sideways or backward. Externally rotate your arms, the elbow crease should point forward as opposed to inwardly. Straighten your shoulders and spine as much as you can. Breathe abdominally. From there, shift bodyweight to your feet and palms and start elevating your rear off the floor. Hold the position for as long as it is comfortable and stop if you start experiencing discomfort. How long you hold the position, how often you should hold it is part of the “less and more” (shorter duration, more frequently) idea. It really depends on each individual and how it feels as you do the movement. From the original position, press down firmly with your heels to increase friction in your feet, then push ​off your legs (you should feel the effort in your ​quadriceps), which will move your waist ​backward, as far as you can (maybe push a little further until your waist goes a little beyond your hands). Immediately start ​to ​pull from your heels this time. Again, make sure to press downward on your heels ​(you should feel the effort in your hamstrings) to move your waist back ​forward ​to where​ you originally sat​. Either get back to sitting if you feel you need it, or continue with the same back and forth motion a few times, again depending on how it feels for you. While the actual inverted foot-hand crawl technique is more technical than this, those two drills are a fantastic way to get physically ready for the real deal and groove the proper, efficient movement pattern that will enable a lifetime of crawling. These are the kinds of things we teach at our comprehensive natural movement fitness Certifications and Workshops. Please join us at an event near you!